Excellent paddle combo case. Glock 22 magazine and a set of peerless cuffs sit nice and tight, no rattling and I don't have to worry about them falling out. Just right with great response time. Typical Safariland. Top quality. Easy ordering and fast shipping. Very good product with Safariland quality. Fits well. Nice to find this for a lefty. It does hold the mag and cuffs tight. Most officers are taught to handcuff from strong side, so cuffs are on the wrong side, for my body, it is to close to my body and pinches my skin when it rubs below my bottom rib, Does not allow me to spread my equipment out on my belt. Excellent product. Safari never disappoints. Very comfortable to wear and very secure. Great piece of gear. 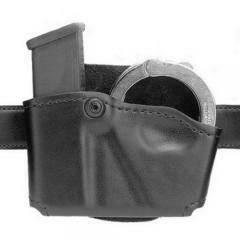 Holds tight for both the mag and the cuffs. I would recommend for sure. Got exactly what I expected. Fast, reliable service. Exactly what I was looking for. Has a nice leather finish and the magazine does not slip out of pouch. Not what I expected. Cuffs are hard to get out and put back in. Bought this for my S&W model 100 blued cuffs and my Springfield XD9. Had to take tension screw out for about a week with cuffs and mag in it to help form. After that put screw back in and works like a charm. Excellent piece of equipment, works perfectly. will this fit a .357sig mag from the Sig P229? or only a 9mm mag? It should fit 9mm.40.357 magazines. does this fit the duty size belts? 2" and larger? Paddle with belt hook fits up to 2"
Picture shown is a right handed case which will go on your left side with magazine in the forward position. Left handed would be reverse.